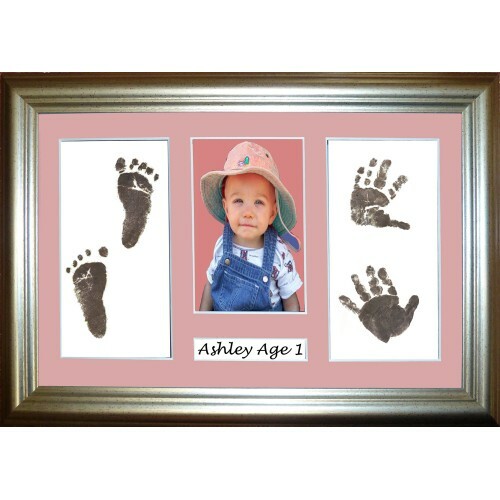 A brilliant & fascinating way to show off your hand and foot prints, this is a large 12” x 8” Framed Prints Kit with a Silver effect frame, you will get one inkless wipe, 2 large sheets of specially treated paper and the frame, complete with all necessary fixings and instructions for you to create your own special keepsake, there is even a space for you to add name or date details; these are added easily by writing or printing on some paper or card and fixing to the back of the mount. The two outside spaces are approx. 6"x3" (152mm x 76mm); the middle, photo space is approx. 5" x 3" (127mm x 76mm) and the name space is approx. 0.5" (12mm). 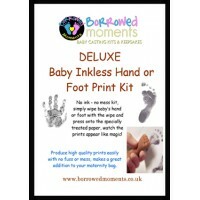 This kit is perfect as a keepsake for grandparents or to commemorate a special milestone like 1st birthday or Christening, a really simple way to capture a special moment with no mess and no tears. 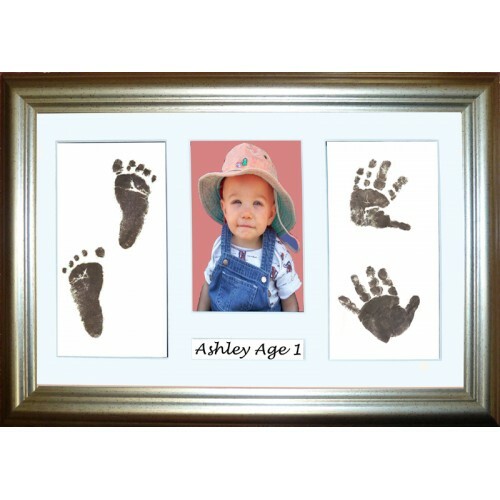 Any extra prints can be kept in a keepsake box or book or used to create other keepsake items. Safe to use even on newborn babies. The wipes are easy to use and make no mess, so they are brilliant for capturing the prints, the same prints can be used to make a variety of other keepsakes on our website, so perhaps at a later date, you may choose to have something else made from the same prints. Our basic Inkless Wipe Kit, it contains 1 Inkless Wipe, 2 sheets of the special paper (these will no..
A brilliant & fascinating way to show off your hand and foot prints, this is a large 12” x 8” Framed..
Our Basic Inkless Wipe Pawprint Kit contains 1 Inkless Wipe, 2 sheets of the special paper (these w..